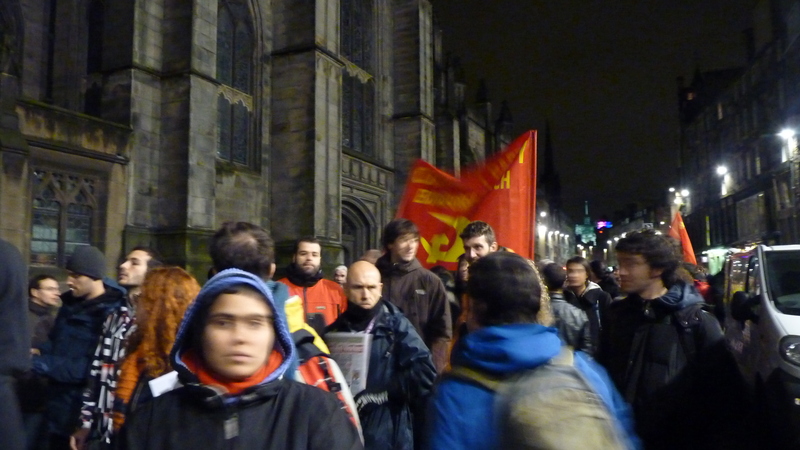 Last night a massive demo took place in Edinburgh. 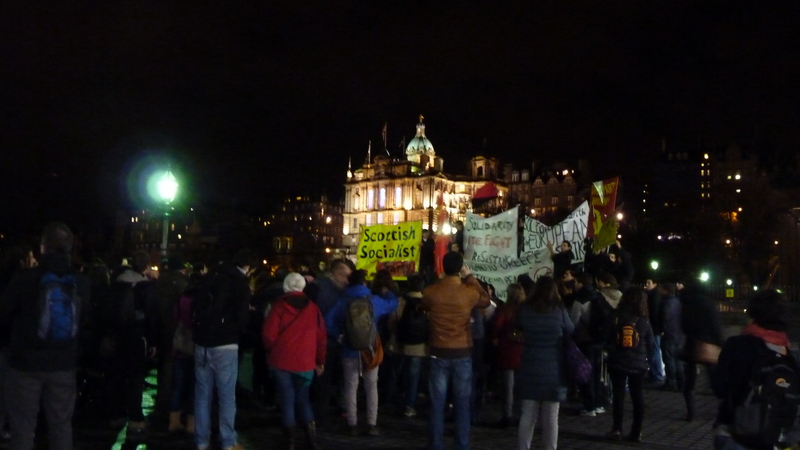 Greeks, Spanish, Portuguese, Italians and Scottish people marched in solidarity with the European General Strike shouting against austerity, showing their will for changing the political system. 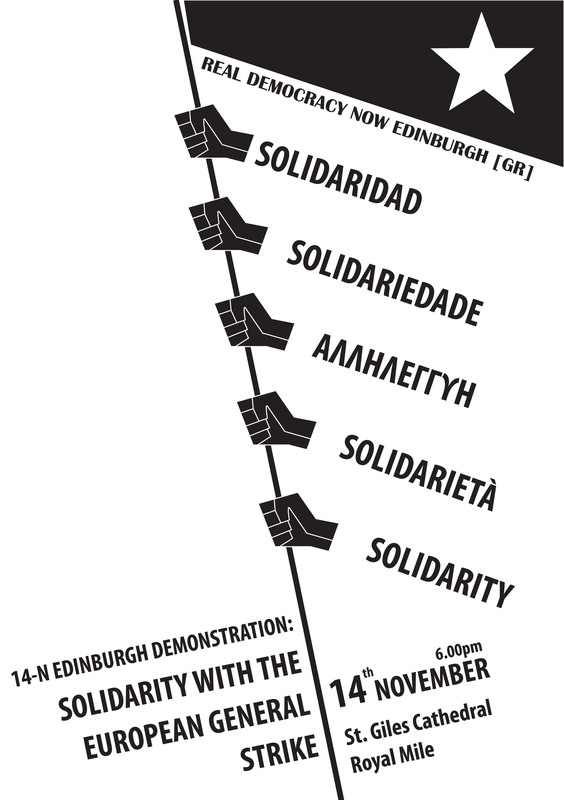 We hope that this demo was only the beginning, and that the EU governments are going to find us united in this battle. Thank you all for coming! On the 12th of February the non-elected Greek Government adopted a new austerity plan, approved by the Greek parliament, which forces people into misery in order to save the European Banks. The 22% cut on the minimum wage (480 euros – 435 for young people), reduction on pensions, the abolishment of the collective bargaining, the privatization of the public sector (including health care and education) are only indicative measures for the future of the Greek people.The “rescue” plan for Greece includes 130 billion euros, provided by European tax payers, which are not planned to serve the people but will only be given to the European Banks. On Sunday the 12th of February the hundreds of thousands of Greek people took the streets fighting against the measures imposed be the EU, the European Central Bank, the IMF which would lead to the enslavement to the bankers. 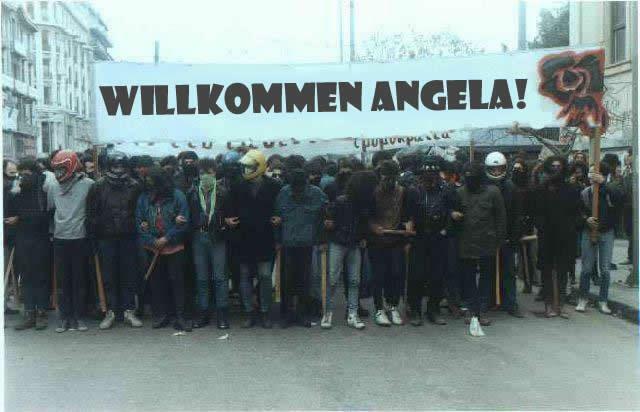 On the streets they gave a battle against the violent repression of the police forces having also as an opponent the “silence” of the media on demonstrations. Greece is only the start before the generalization of the measures all over Europe. 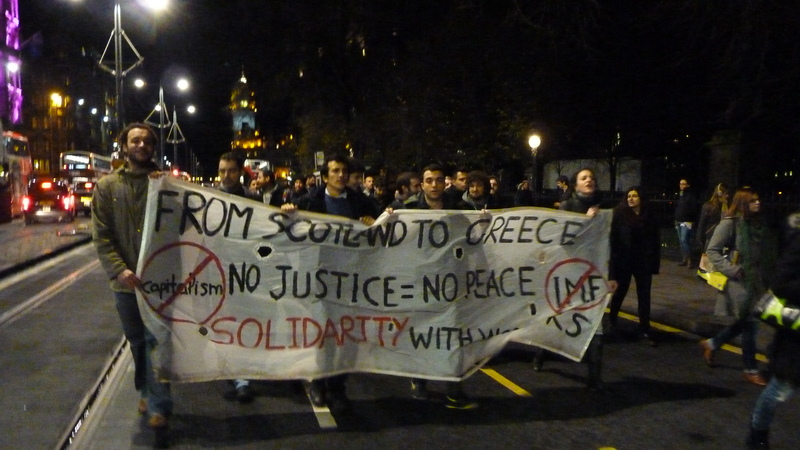 The people of Greece need the international solidarity and they call for our support.Let’s stay united and fight back AGAINST the austerity measures, AGAINST repression, AGAINST the dictatorship of bankers. WHEN THEY SAY CUT BACK, WE SAY FIGHT BACK! On Saturday 18th of February there will be demonstrations everywhere in solidarity with the mobilization of people of Greece. 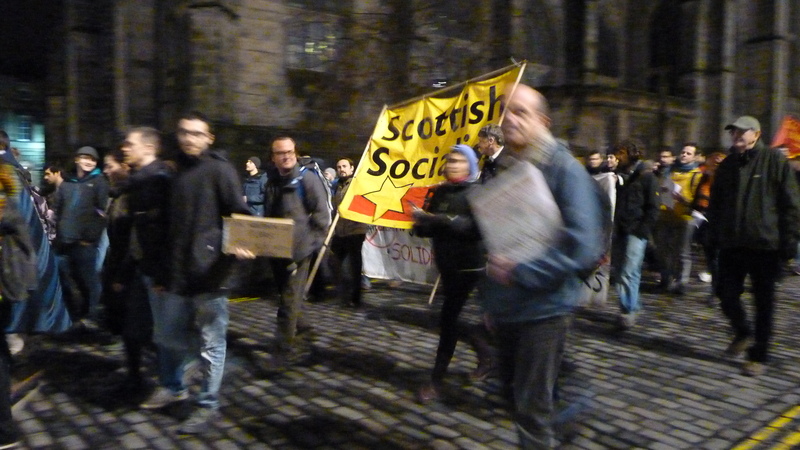 We make this call at 12.00 outside the City Chambers at Royal Mile. See you ALL there! 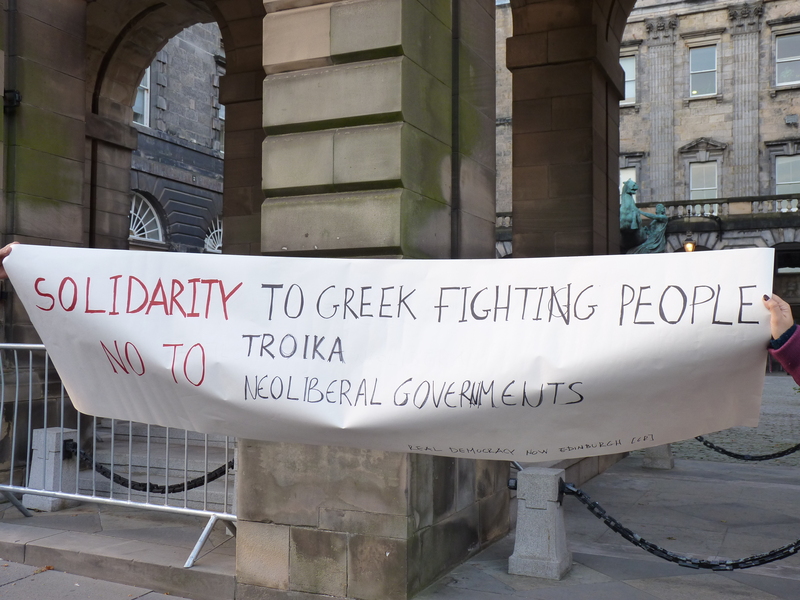 Meeting of solidarity to the striking Greek workers! On Sunday 12/2/12 the unelected coalition government of Greece will play the IMF and troika game once again and vote for a series of new, even harder austerity measures than the ones already exist leading the working class of Greece in absolute misery and poverty. For the past three years the Troika, the IMF and the fasco-governments of banking interests have led Greek workers into a new period of austerity. Consequently unemployment rates have reached a 40%, while funding for education and healthcare have reached record-lows. Homeless people have increased up to 20.000. Privatizations and selling of all the public wealth, more than 40% of wages total halve reaching 350(!!) euros per month for young people, emergency taxes have been levied on top of older ones only to make the survival of workers practically impossible. To add insult to injury governments and their hired mouthpieces in the media shamelessly accuse the people of laziness, corruption and tax-evasion. Greece was only the beginning. International capitalism will try increasingly to exact its toll from the people of Britain as well. Our answer will be their worse nightmare. Greek working class including the vast majority of the public and private sector unions is on a strike for two days now, while the Greek steel workers are on the 3rd month of their heroic strike. Working class is not the one that created the crisis and of course not the one that is going to pay for it. A system that makes us live in misery, a system that makes us pay for its own crisis IS NOT OUR FUTURE! Things are going to be only worse if we don’t fight back. Confronted with privatization and cuts, unemployment and humiliation we consciously opt for decency: a worker’s internationalist movement guided by our social needs. 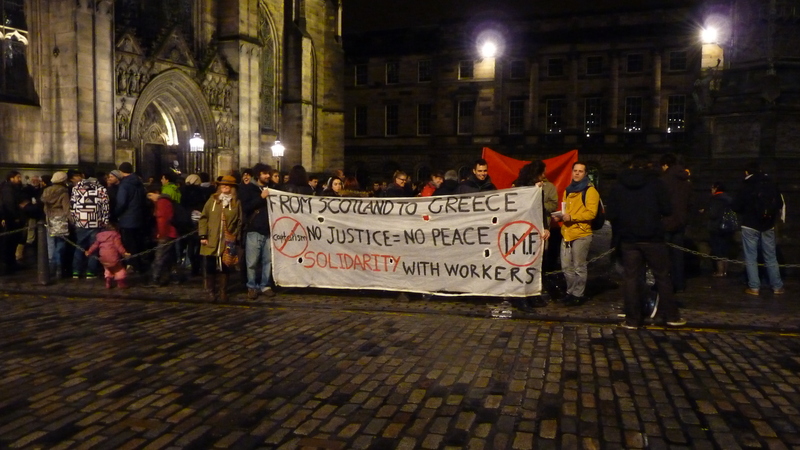 From Scotland to Greece, From Spain to Ireland we are all workers. Our rights are the same, our enemy is the same. Our goal should be the same. IF IT’S NOT FOR US THEN WHO?